Have you ever seen a car that simply comes across as the perfect interpretation of a particular style? Admittedly, I’m not the world’s leading authority on what a mid 2000’s drift car should look like; however, the first time that I laid eyes on Evan Brown’s 1987 Mazda RX7, I knew that it was exactly what embodied that particular style to me. Evan is an interesting character; a guy that seems to always be going full throttle in all aspects: in his mind, in his work, and in his car. In short, the exact type of person that you would expect to own such a wild vehicle. He owns and operates his own business, ITEM-B, a sort of a blog-turned-tuner-shop. He covers everything that he loves on the website, ranging from his personal adventures across the country, to the cars that he has a hand in building, to his own crazy builds such as this RX7 and his current KP61 Toyota Starlet project. 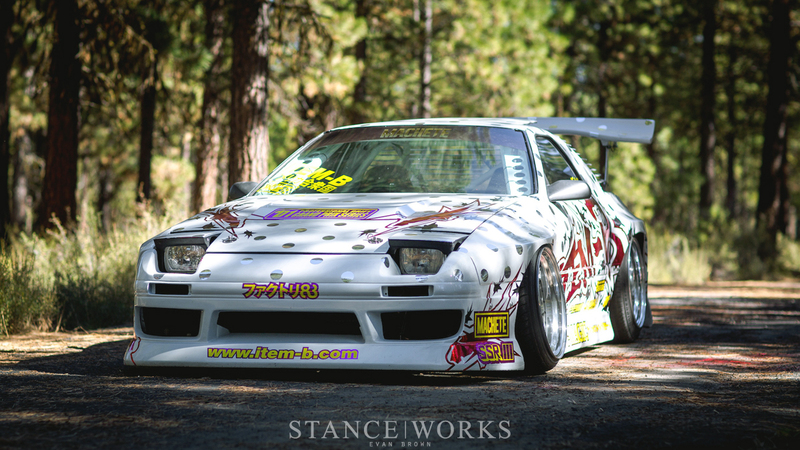 The bold style of the RX7 you see here came from his appreciation for the aforementioned early to mid 2000’s drift cars, specifically D1GP and D1 Street legal cars. Drawing inspiration from the likes of JTP, George Marstanovic, and Hertrech; he’s come up with a car that is familiar enough to look classic while having enough personal touches to stand out. In the three short years the car has been in his possession, he has transformed a basket case RX7 into a monster that most anyone can appreciate. One of the first things that really grabs attention is that amazing livery done by the extremely talented Machete group of Seattle. With chrome polka dots and a giant ITEM-B logo, you can’t miss it. The classic D1 style motif covers 85mm widened front fenders, 140mm rear over fenders, a D-Max vented hood, and a BN series Aero kit. You’ll also notice the custom rear louvers in place of the rear window, a feature that Evan is quite fond of. Topping it all off is a Big Country Labs rear wing. The combination of parts and vinyl are nothing short of striking on the glossy pure white base. Sticking with the “more is more” theme of this car, you’ll find nothing less than a built up LS1 under the hood. It’s been given the bolt-on treatment; with Patriot stage 2 LS6 heads, a custom grind Comp camshaft, 1.7:1 rocker arms, and titanium springs rounding off the valvetrain. Other parts include an LS6 intake manifold and ported throttle body. This setup provides plenty of reliable power to spin the massive 18x11.5 polished Work Meisters in the rear. Front wheels are SSR Hasemis that have been upconverted to 18x10.5 by MemoryFab out of Union City, California. 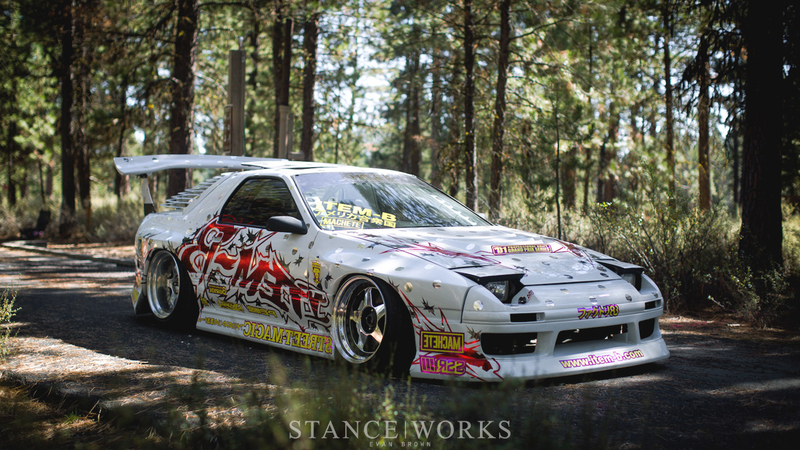 A set of K-Sport Slide Control coilovers help this car with its undeniably aggressive stance. A custom fully adjustable angle kit and Turn One power steering kit make sure that this car can play the part of drift car just as well as it looks it. 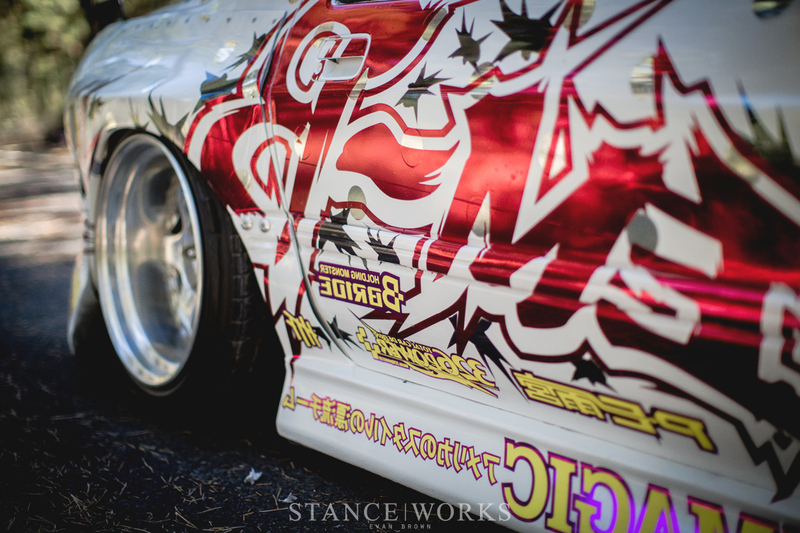 Inside is much of what you would expect with a purpose build drift machine such as this. A tidy custom aluminum dash houses a full array of autometer gauges to keep everything in check. While Evan (and whomever he convinces to ride along with him) is treated to some leather reupholstered Bride Brix 1 seats. 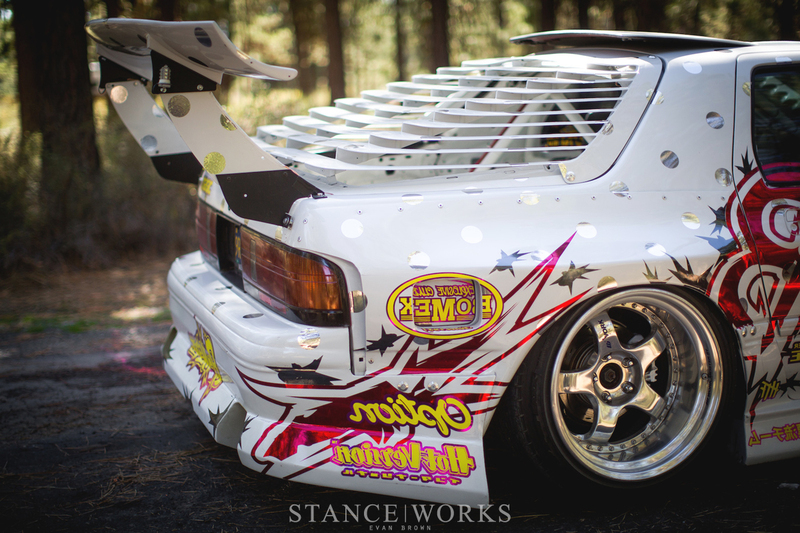 All of this is safely surrounded by a custom fabricated roll cage, built to Formula Drift specification. 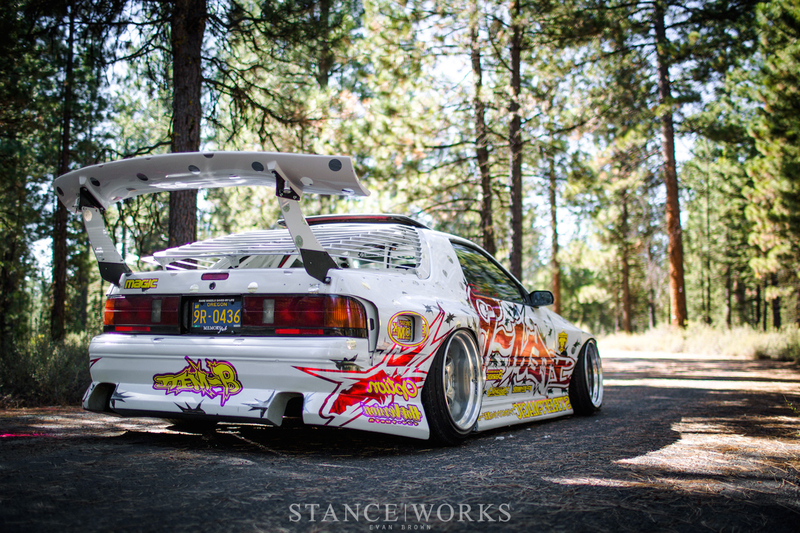 Of course, as most any of us who build cars can relate, Evan mentions that the RX7 is hardly a finished product. He’s currently in the process of relocating to Springfield, OR with a much larger facility and some in-house partners. After seeing a few of the things they have in progress, I can assure you that this won’t be the last time you hear of Evan, the RX7, or Item B. Make sure to check out the item-b.com blog to keep up to date on what they have going on. “The bold style of the RX7 you see here came from […] mid 2000’s drift cars” and then I read “LS1 under the hood” I mean wtf? Exterior looks great, I’d say thats more of a early 2000’s style, too bad the interior is too rally-ish to see this as a consistent project. Exterior, interior and engine are all from a different story. Good job Levelride Concepts on the cage and interior paint. Looks amazing! I’d say it’s a D1 inspired RX7 with a dash of America. I wouldn’t call the interior “rally-ish”, a stripped interior is synonymous with rally, road racing, and drifting alike.